Many students arrive at law school feeling uncertain about what they want to do with their law degree and often need some time, self-assessment, and experience to figure it out. Still, it’s not too early to begin thinking about your career goals and, on a smaller scale, your post-1L summer job. 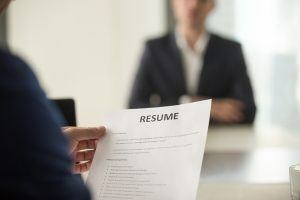 Whether you know exactly what you want to do with your JD, have absolutely no clue, or fall somewhere in between, there are a few things you can do now to help set the stage for what will likely be your first legal job search. I know that some of you are thinking, “But, I’m a busy person, and I don’t have time to think about next summer when I haven’t even set foot in a law school classroom.” Look, I may not know you or what you’ve got going on right now, but I am confident that the majority of y’all are about to get a whole lot busier than you are at this moment, so just trust me when I say NOW IS THE TIME. If you want to learn why that’s the case and what I’m suggesting you do this summer (I promise it’s nothing too strenuous), read on. Balancing class, studying, and other responsibilities like grocery shopping and bathing is difficult enough during your first semester of law school without also having to worry about job applications, interviews, and other career-related activities. The National Association for Law Placement (NALP), an association consisting of law schools and legal employers, has a set of Principles and Standards for Law Placement and Recruitment Activities. These guidelines were created, in part, to ensure that 1Ls are focusing on their studies rather than a job search during the first few months of law school. The summer employment provisions for first-year students found in Part V (D) provide national “blackout” dates that regulate 1L student contact with employers and the law school Career Services Office (CSO). The good news is that none of these restrictions go into effect until you actually begin law school, which means that right now you’re free to talk with whomever you want. I don’t mean to suggest that every incoming 1L should be clambering to talk with their law school CSO this summer. Generally speaking, there’s no real urgency in that regard. However, if you have any burning questions about your career plans or expect to work with the CSO on your resume when you arrive on campus, know that there’s going to be a temporary roadblock in place. I’ll talk more about connecting with potential employers below, but, as it relates to your interaction with the CSO this summer, my biggest piece of advice is to read the emails they send, heed their advice, and take advantage of any assessments or services they’re offering. Again, it isn’t imperative that every incoming 1L is engaging in attorney outreach this summer, but there are a couple of situations in which it can be especially beneficial to do so. For example, if you’re going to be attending law school on the East Coast but are currently living in the Midwest and hope to come back and work there next summer, it makes sense to start establishing a legal network in the city where you’d like to be. Reach out to attorneys who are doing the type of work you think you might be interested in and see if they’d be willing to grab a cup of coffee or have lunch with you. Let them know that you’re heading off to law school soon and will touch base with them when you’re back home over the winter break to discuss potential summer employment. If you’re not sure what you want to do with your law degree, now is also a great time to arrange some informational interviews. Set up a meeting or phone call or shadowing opportunity with attorneys working in areas you’d like to explore. In my experience, most attorneys are happy to talk with students about what they do. This can be a great source of information and advice, while also allowing you to build new connections. If you haven’t already created a LinkedIn profile, make it a priority to do so before classes begin. If you’ve already got one, don’t forget to update it to reflect your status as a current law student. This is a good way to start connecting with your classmates and faculty and stay connected with any attorneys you meet this summer and over the next year. If you’re looking for some summer reading material, Amanda Ellis’s The 6Ps of the BIG 3ä for Job-Seeking JDS offers some great advice on how to use LinkedIn (along with Twitter and Facebook) to help you land a job. If you prefer podcasts, The Happy Lawyer Project recently did a great episode on marketing yourself on LinkedIn. While I definitely don’t recommend stressing too much about jobs and grades before you’ve even begun law school, it’s good to keep in mind that good law school grades will optimize your job prospects. The Start Law School Right course is a great way to reduce some of the anxiety and uncertainty you may feel going into your first law school courses and help set you up for success in both the classroom and your job search. Kala Mueller is the Director of Public Interest Programs at the University of Nebraska College of Law. She received her B.S. in Criminal Justice from the University of Nebraska-Lincoln and her J.D. from the University of Wisconsin Law School, where she served as a senior editor for the Wisconsin Journal of Law, Gender & Society. Before joining the law college, Kala worked as a prosecutor and with a civil litigation firm where she practiced primarily in the area of personal injury defense. She lives in Lincoln, NE with her husband and three sons.